It was no secret in higher Party circles that the Jews were to be exterminated. 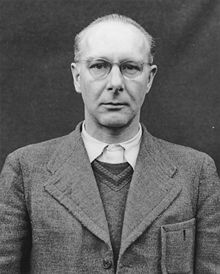 Viktor Brack (November 9, 1904 – June 2, 1948) was the organizer of the Euthanasia Programme, Operation T4, where the Nazi state systematically murdered German disabled people. Following this, Brack was one of the men responsible for the gassing of Jews in the extermination camps, and he conferred with Odilo Globocnik about the practical implementation of the Final Solution. He was executed after the Doctors' Trial in 1948. Dear Reichsführer, among 10's of millions of Jews in Europe, there are, I figure, at least 2-3 millions of men and women who are fit enough to work. Considering the extraordinary difficulties the labor problem presents us with, I hold the view that those 2-3 millions should be specially selected and preserved. This can however only be done if at the same time they are rendered incapable to propagate. About a year ago I reported to you that agents of mine have completed the experiments necessary for this purpose. I would like to recall these facts once more. Sterilization, as normally performed on persons with hereditary diseases is here out of the question, because it takes too long and is too expensive. Castration by X-ray however is not only relatively cheap, but can also be performed on many thousands in the shortest time. I think that at this time it is already irrelevant whether the people in question become aware of having been castrated after some weeks or months, once they feel the effects. Should you, Reichsführer, decide to choose this way in the interest of the preservation of labor, then Reichsleiter Bouhler would be prepared to place all physicians and other personnel needed for this work at your disposal. Likewise he requested me to inform you that then I would have to order the apparatus so urgently needed with the greatest speed. Heil Hitler! Yours, Viktor Brack. Letter written to Heinrich Himmler (23 June 1942). Quoted in "And the Crooked Shall be Made Straight" - Page 308 - by Jacob Robinson - 1965.